This month, LaMontagne Gallery moved out of an outpost on Melcher Street, near the Institute of Contemporary Art, where it opened last May, and reopened with a two-person show in a second-floor loft in South Boston, a block south of the Distillery. New Yorker Langdon Graves’s selection of drawings and sculptures turns a back room into an evil doctor’s office or an alien lab. One sculpture, “Monstrae #6” (2007) is a pink flashlight-like thing with a cord coming off the handle that has a pink thorn point at the end. It seems like a threatening medical probe. 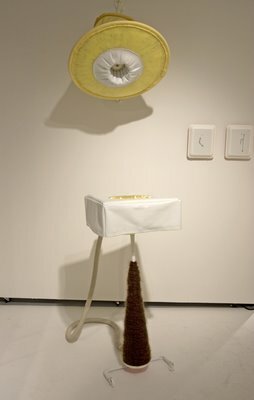 Another, “Heirloom” (2007), looks like a giant vinyl tissue box, or maybe a sink or an altar, sitting atop a hairy post, with a vacuum hose running from the base of the post to the side of the box. Hanging off the wall above is a soft yellow cone-shaped thing that resembles an operating-room lamp. Graves’s mix of vinyl and fur, holes and rods, gives the pieces a memorably discomforting sexual tone. They feel like David Lynch crossed with Claes Oldenburg, with strong echoes of Matthew Barney. “Langdon Graves: Preparations," LaMontagne Gallery, 555 East 2nd St., South Boston, Jan. 5 to Feb. 8, 2008. Pictured: “Heirloom,” 2007, with a couple drawings.